Happy Birthday To Me: A Brand New Suzuki! (Hey, that's a rhyme)! Happy Birthday To Me: A Brand New Suzuki! (Hey, that’s a rhyme)! 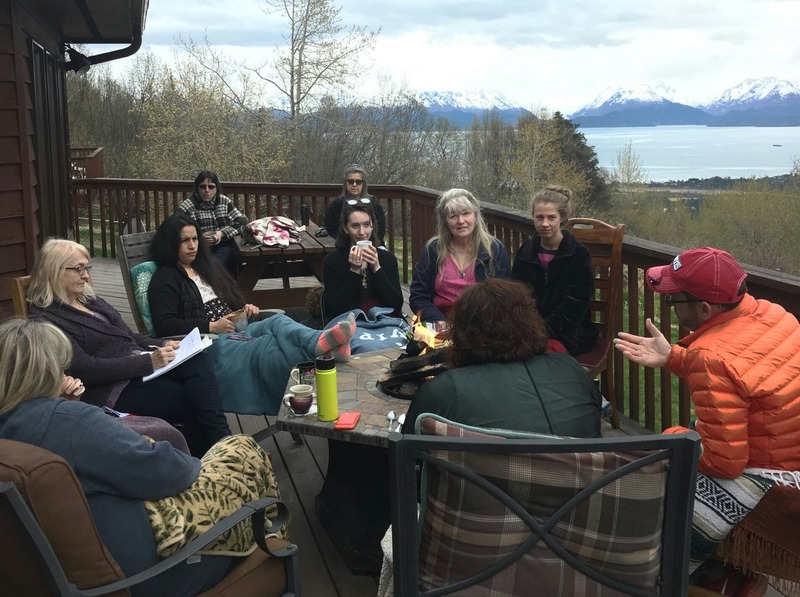 So much going on at Majestic View Bed and Breakfast. Where to begin? Well, lets start with the new Suzuki! 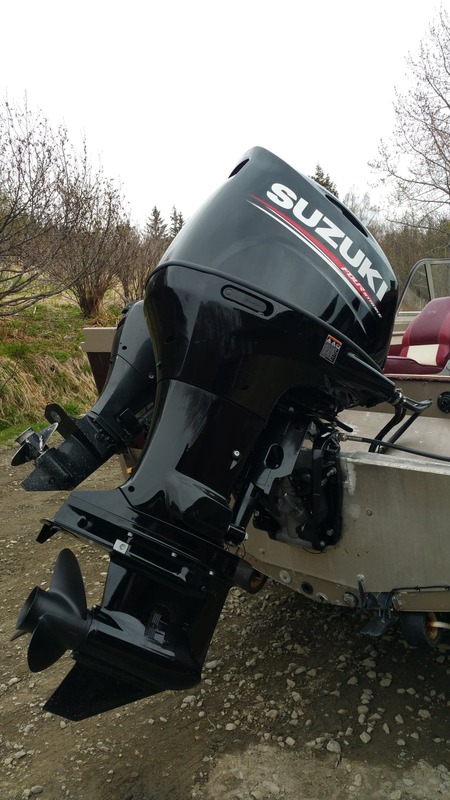 The story goes: a few years ago, I blew the head on the original two stroke Evinrude that was on my 20 foot Lund Tyee. I needed an engine quick – can’t be down too long with guide trips on the schedule. I looked high and low, and the best I could come up with was a a 115 Yamaha four stroke – a great engine, but underpowered for the size of my boat. It did the trick the majority of the time, but I found with four or more people and gear, it had a hard time getting the boat up on plane. I made the best of it, knowing I would upgrade as soon as I could. Last fall, the owner of All Seasons Honda, who also deals in Suzuki, told me about a “guide program” offered by Suzuki. Essentially, all I had to do was produce my credentials, and I would get about $4,000 off on a brand new engine. I worked hard and saved all winter, so that I could pay cash for the engine. It helped that I sold the 115 Yamaha for $6000, which is $300 more than I paid for it three years ago! Well, the transaction couldn’t have gone any more smoothly! I’m in the break-in phase, having to treat it like a baby for the first 20 hours – but man, it sure is smooth and makes that boat jump right up. More boat upgrades are on the way. I just ordered all new seats, and will begin working on specs for a cabin addition this Tuesday. I will have the rockinest Lund in all of Alaska, so stay tuned! I’ve been back to doing tours in the boat. Alan and Karen did some “casual fishing” with me right here in the bay (casual means “catch and release.”). No need to go way the heck and gone out there, like the charters do. Why not spend your time fishing instead of traveling? Well, that’s what I do. We caught halibut, flounder, cod, and irish lord within minutes of the spit – probably about 40 of them. 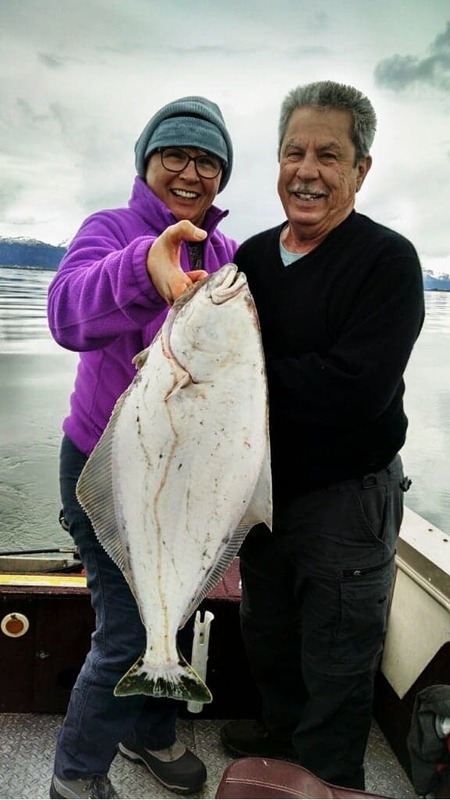 Alan was happy to see Karen improve to the point of working the rod and reel, feeling the fish, setting the hook, and bringing them in. By the end of the trip. she had caught 6 all by herself. The only thing I had to do was bait the hook and take the fish off – EASY PEASY! On a couple of wildlife and scenery tours – we got up close and personal with otters, seals, gulls, eagles, kittiwakes, guillemots, and more. 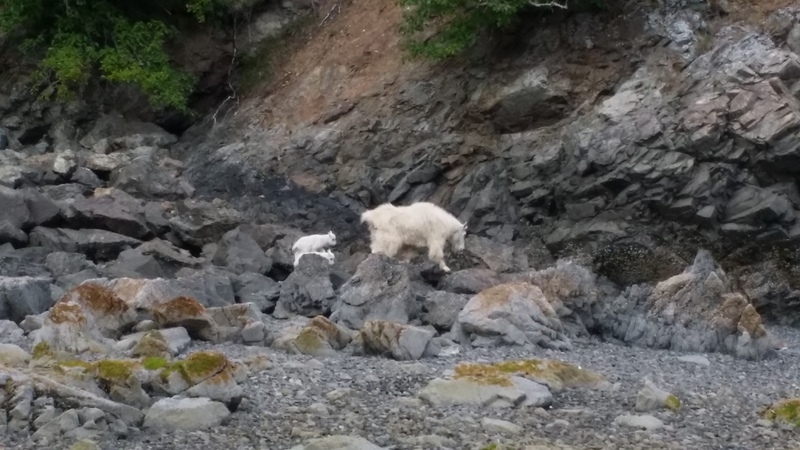 More distant – we saw one black bear, and numerous mountain goats – some of which came right down to the beach (this is more rare, maybe the third time I have caught the goats doing this). Speaking of catching things, yesterday am, with Eric and Marie from Portland, we “caught” two otters doing the wild thing. Yup, they were mating. Its kind of fun to see the reactions of people when something like this happens. Many feel embarrassed, and want to leave the otters in private. Me? Exactly the opposite. Lets get in close and witness this rare event. They are oblivious anyway; they aren’t people. So, I want to hear the moans and grunts. The biting, and so on. And so we did, while Marie took photos and video. It was quite the wild romp those two amorous otters took, and we have proof! We had our first full weekend at Majestic View, but with the holiday weekend winding up, everyone left this morning after breakfast. We have a couple of “down days” to regroup, and then we get really busy again starting June 1st! I’m off to put together a new BBQ grill, power wash my boat, and get a much needed shower. Happy Memorial Day Weekend to all. God Bless all who serve, have served, and their families. Lets remember them this day.